Our Cape May, New Jersey lodging has been entertaining guests for three decades. Since we serve breakfast to nearly seventy guests some mornings, we have developed many recipes which make entertaining such a large group as easy as possible. 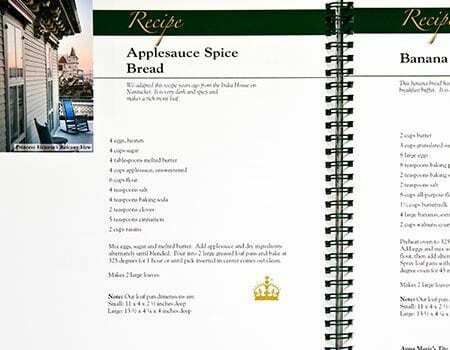 Guests often asked us to share recipes, and so The Queen Victoria® Cookbook was born. The Queen Victoria® Cookbook features over eighty recipes for easy, elegant entertaining. It also includes recipes for a wide selection of sweets and savories for tea time as served in royal style at The Queen Victoria. Our original cookbook was first printed in 1992, with over 15,000 copies sold. In 2009, we published a brand new full color edition of the cookbook featuring virtually every recipe served at The Queen Victoria® and filled with photos of The Queen Victoria®. This cookbook will make a wonderful addition to your own kitchen library or an excellent gift item. Shopping in Cape May was never this easy! Call award winning bed and breakfast at (609) 884-8702 to order your cookbook. Entertaining a group is a challenge if you want to enjoy your guests. At our bed and breakfast, we don’t like spending all our time at breakfast in the kitchen, and would rather be in the dining room enjoying our guests. Most of the recipes you will find in the Cookbook can be prepared in advance and kept warm on a buffet for easy, yet elegant entertaining. Other recipes for breads, cookies and spreads are improved by being prepared in advance and frozen or refrigerated to blend flavors before serving.Most of the recipes in the Cookbook serve a larger number than the usual four people. You can, of course, reduce the quantities to serve a lesser number if your party or family is smaller. Even the bread and cookie recipes make a large amount. Use the extra to freeze for the future or to give away as gifts.